Image caption Estyn found Welsh medium schools in particular have staff-cover problems. Too many primary schools in Wales are failing to manage the effects of teachers being absent from work, education watchdog Estyn has said. Only a minority of heads use Welsh Government guidance to help improve the management of teacher attendance. In its report, Estyn says nearly all primary schools have experienced difficulties arranging suitable cover for absent class teachers. The Welsh Government said it planned to issue "fresh advice" later this term. Estyn's chief inspector Meilyr Rowlands said schools need to monitor and track teacher absence in order to raise awareness about the potential impact on learners. Schools should also monitor the work of supply teachers to ensure pupils make progress. "Primary schools need to make sure that they evaluate the impact of teacher absence," said Mr Rowlands. "Monitoring and tracking the reasons for teacher absence can help to raise awareness of the potential impact of absence on learners. "They should also monitor the work of supply teachers regularly to ensure that pupils make appropriate progress." Inspectors found in the majority of schools, supply teachers use the school's documents to plan lessons, but when this information is not available, supply teachers focus on keeping children busy, rather than plan lessons that build on pupils' knowledge and skills. Guidance was issued by the Welsh Government in July 2015 but although most head teachers were aware of it, Estyn found but only a minority have read and acted on the document's recommendations. 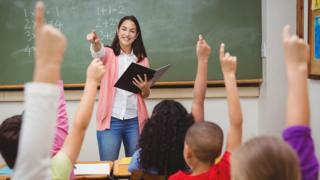 Back in 2013, an increasing use of supply teachers to cover sickness absence was affecting pupils' learning, according to reports by Estyn and the Wales Audit Office. They found nearly 10% of lessons were being covered by supply teachers. On average, each teacher in Wales was absent for seven days a year in Wales, compared to 4.5 days in England. A Welsh Government spokesman said it had asked Estyn to look at current guidance for teaching staff and the recommendations will be considered as part of the "fresh advice they plan to issue later this term". "Good practice exists in many of our schools and we want to make sure this becomes the standard across Wales and will continue to work with school leaders to effectively manage sickness absence," he said. Gareth Evans, director of education policy at the University of Wales Trinity St David, said the "huge reliance" on supply cover did have an impact on children. "All the evidence suggests that pupils make less progress when there is a different classroom teacher in front of them," he told BBC Wales. "There is an inconsistency in learning - supply teachers don't know the pupils and the youngsters' individual needs. "Another important factor is behaviour - pupils are less likely to respect and value the teacher in front of them if they know they're not going to be there more than a day or so." Mr Evans added Education Secretary Kirsty Williams needed to act fast on the issue, especially since she had vowed to cut class sizes from around 30 to below 25. Darren Millar, shadow education secretary has criticised the Welsh Government for "failing to properly communicate guidance on absence cover in Welsh schools". He said it was "galling given the millions of pounds the government spends on communication."